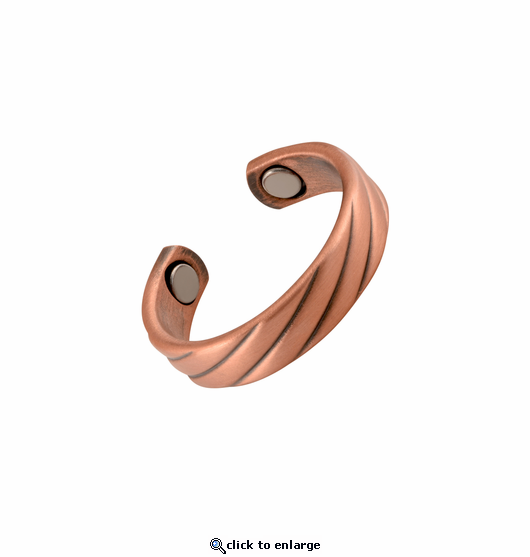 This is a nickel free copper magnetic adjustable ring with a stylish swirl design. It has a 1500 gauss neodymium rare earth bio north facing magnet on each end. It will fit small to medium finger ring sizes about 6 - 9. I developed pain in my right index finger and ordered one of these rings. Gradually the pain subsided and mostly disappeared. I lost the ring after some time and the pain returned shortly thereafter. This new ring has a nicer look/design to it I think and in the couple of weeks I've been wearing it the pain has once again subsided. The four stars instead of 5 is because the ring only comes in one adjustable size and it doesn't fully wrap around an index finger. Still it works and looks nice enough to pass for a ring. I love the look and it has helped my finger, not having the pain I was. product and rates each product with 5 Stars. I love my copper ring! It looks really good on my finger! I am brown skinned so the contrast is really nice :) Thank you. I will be looking at buying an anklet in the future. super fast shipping/ just as described. will order again! 5 star!! received promptly and I am enjoying this ring.